With Friday the 13th: The Game, the developers of Gun Media gave the famous serial killer Jason Voorhees a new platform to kill. You'll find him on the campsite Crystal Lake again and either try to survive or killer your assassin. Killer or Survivor? Everyone is killer and times Survivor, which is selected just before the start of the match. The lobby creator can determine a player as a killer. You can choose if you want to play as Survivor or as a killer. Playing Time The game ends after 20 minutes and then decides on victory or defeat. The game ends when there is no survivor on the map, either because they have escaped from the exit or have been sacrificed. A duration is not fixed. Maps So far, There is a large map called "Camp Crystal Lake". There are different maps, each tailored to a killer, yet every killer can play on every map. Some of these maps have different variants. In contrast to Friday the 13th, you must definitely do something, otherwise you will die in any case. - Search: You should definitely search everything. This is the only way to find potential weapons. This includes axes, pipes to hit and a gun, but you can only shoot once. There are also baseball bat and traps. But you can also find other items such as a Walki-Talki, a cell phone, car keys, a car battery, gasoline, medi-kits, other useful items that are useful for your tasks. - Items You Can Take With You: As a survivor, you can carry a weapon in your hand and otherwise you can find 3 additional items that you can find. - Walki-Talki : If you are playing with friends and talking or another voice chat, this tip could be interesting for you. Because you can only talk with the other Survivor on the voice chat, or listen to him, if you have found a Walki-Talki. - Killer in the Vicinity: If the killer is close, then you hear the disturbing music with the squeaky violins. Sometimes you also hear a kind of whisper and breath (ci ci ci ka ka ka ha ha ha). If you hear it, then just one of the killer's 4 abilities has been charged. Even the killer himself can hear that. - Stamina: Always keep the red bar at the bottom right of the map. This is a half circle. If it is empty, you have no more stamina and can only run slowly or just stand still to recharge it. If your stamina is exhausted, you cannot run and stumble. You also always stumble at escaping when your character is scared. Above all, the swimming costs a lot of energy. - Speed: You can move slowly or fast. You can walk and even swim through the lake. In addition, you can also climb slowly through a window or jump quickly, which looks funny, as you jump forward with your shoulder. - Sense and Shift mode by Jason: Jason can see the auras of his victims and quickly pave through the area. If it is in the perception mode, the image becomes paler when you are near. Jason, too, is missing the colors, then he sees mainly red. Jason teleports, then a kind of rewind animation appears on your screen. It looks on your display as if you had a picture disturbance. - Protection in the house: In the houses you are as a Survivor in principle, the safest for the time being, because Jason cannot move into houses. But remember, outside the buildings you are visible to the killer, since he can see red marked your auras. If you are in a house, then you must see yourself to find you, or to look through the walls with the shift ability. - Window: If you jump quickly through a closed window, your character will damage and possibly die. So you should not jump through a window if you have already been injured, because you may even die. By the way, not all windows can be opened. If you go through a house, you should have a look at the window through which window you could escape in an emergency. - Doors: You should always close doors, so the killer thinks you were not here yet. In addition, the killer needs a while to get through the closed doors, as he often hits them with his ax. 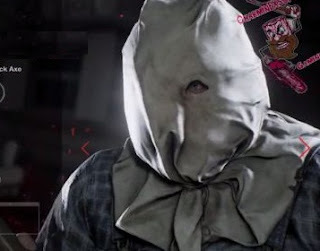 Nevertheless, the killer can open the doors normally, but some doors can be locked with a lock (with E lock), then Jason still needs longer or more hits to destroy them. So close the doors if Jason is still a bit away from you. But if he is right behind you, then it will only take time. - Tommy Jarvis: You can call the famous Ranger Tommy Jarvis over a radio, he comes after some time. A dead player then slips into his role and can come back to the game when he is killed and the game is not finished yet. It is random which survivor may return. - Falling : Bear falls are mostly in the barn with the many hay, but of course also in other places. You can set it up and let Jason run as he enters the bear trap. They do particularly well in front of and behind doors. It takes a few minutes to set it up. - Electricity: The electricity has to be repaired at the electricity box, otherwise you can not use the telephone and call the police. Here are some skill checks that you must click at the right moment to complete the reparation. There is always a house, on the outside a electricity power box. Inside is also the phone. - Calling the Police: telephoning the police takes a few seconds, a circle fills up red. You must wait as long as the task is not fulfilled. Police then come in 5 minutes. This time is running out, as long as you have to wait and hide. Only when the police are there, you can leave the place. Otherwise, you can only run with the car or win the game after the 20 minutes. The telephone and the electricity distributors are always somewhere else. - By Car: You have the possibility to repair an car to flee. But you must first find the key, fill in gasoline and install a car battery. Watch the map: You can see the killer on the map, it is the red triangle, the survivor is the white triangle and you are the yellow triangle. If the white ring pulsates around you, you can see how much noise you are doing right now. The bigger it gets, the louder you are. By the way, the faster you move, the louder you are. - Killer Stun: Jason cannot be killed, but you can stun him. He is then out of action for about 5 seconds. For example you can beat him, let him fall into a trap or free you from his catches with a blow. As a survivor, you give some of the sounds that you can betray. So the characters are frightened and give a scream when they see dead survivors or when Jason is nearby. You can hide from Jason, for example under beds, in bushes or in a closet. If Jason is close, then you have to stop the air. However, this can be your teenager, only a few seconds before he blows loudly. This is quite risky.